Rocker Wesley Geer leads a session to demonstrate the program at Foundations Recovery Network. Geer, who went through rehab himself in the late 2000s, started the project in 2012 to offer music therapy as a new form of therapeutic release in treatment centers. It has expanded from its base in California, where it holds about 400 sessions a month, to two treatment centers in Nashville. “Music helps remind the opioid addict that there is a joy and happiness and natural high deep inside them without drugs,” Geer told Nashville's NewsChannel 5. 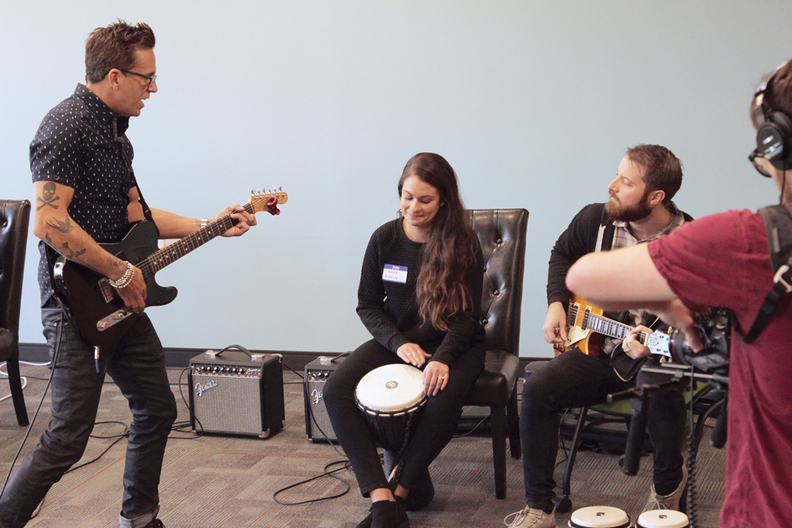 Participants can “rock to recovery” without a musical background, and they'll end the program with a song created with a band of their peers and professional musicians who are also in recovery. The program seeks to help patients recover emotionally and physically. “People in recovery can start becoming activated, re-connecting to people thru the process, as playing music does organically, what psych meds do, helping to stimulate serotonin, dopamine, endorphins, and oxytocin (the 'love molecule') naturally,” according to Rock to Recovery's Facebook page. In Nashville, the organization is partnering with treatment facilities Foundations Recovery Network, Universal Health Services' addiction treatment division, and Buffalo Valley. Rock to Recovery's fundraising concerts have received support from the likes of Billy Idol and the late Chester Bennington of Linkin Park.